This is a Strawberry Rhubarb Almond Cake with Mascarpone Frosting. Strawberry Rhubarb desserts back to back on the blog. (Yesterday I posted my Strawberry Rhubarb Galettes) Can you tell I went crazy with the rhubarb at the farmer’s market this week? So, about this cake. The sponge is Almond flavored. Filled with the light and sweet Mascarpone Frosting and the delicious tangy Strawberry Rhubarb Jam. I decided to make this a naked cake, because my mom LOVES naked cakes! And you should know, this cake is dedicated to my mama, Regina! She is back in Brazil and can’t eat the cake that I made for her. But I had to make her a cake, since it’s her birthday! Feliz Aniversário, mãe! Last year I also made her a cake she couldn’t eat. My dream is to make her a birthday cake once that she will actually be able to enjoy. Well, that’s what living far from family is all about. I moved from Brazil to the US in December 2011. Gotta tell you, friends, it hasn’t been easy. When I came here, I never planned on staying forever, or staying this long, for that matter. I won’t say forever, because who knows where I will end up. I am an open soul. Open to the world and to the possibilities! 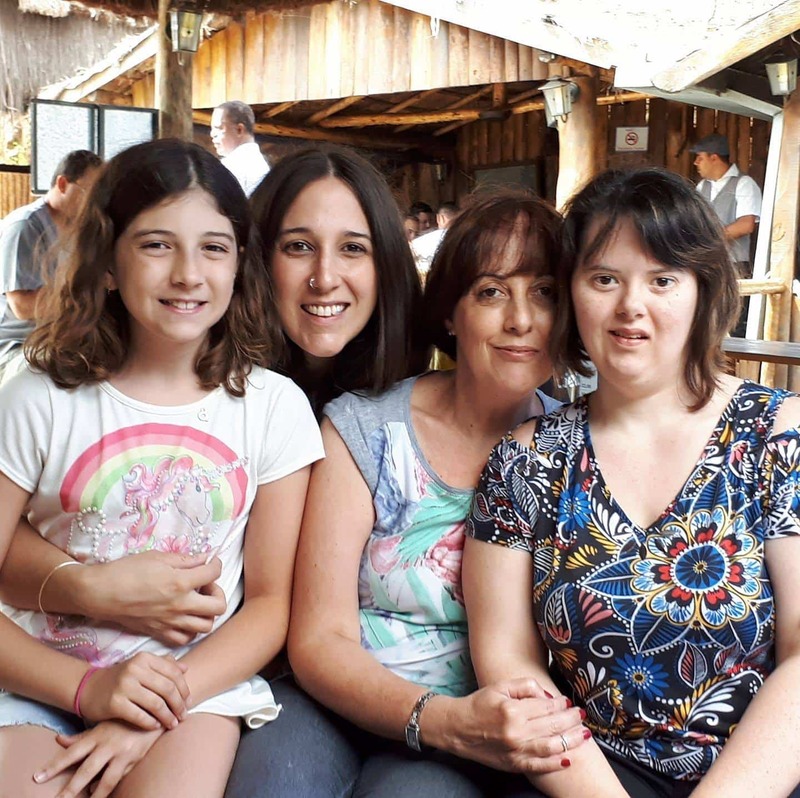 Since I am always missing birthdays, special occasions, holidays, I like to try to celebrate them with my family somehow! We’ve sang many happy birthday songs over video chat in the past few years! And this year, I made this cake for my mama, so I could celebrate her! Really too bad she can’t eat it. Because it’s BOMB DIGGITY delicious! This Strawberry Rhubarb Cake is just like my mom. Delicate, classic, stunning! Here’s a picture of my sisters, my mama, and I, on my last trip to Brazil. Tell me, isn’t she beautiful? I hope she likes the cake I made for her! Hopefully someday I get to surprise her in person with a cake on her birthday! I am all about those surprises! Getting reunited with my family, when I go visit my country, is one of the happiest feelings I’ve ever felt. Actually, one of the things that touches me the most, and 10/10 makes me cry, is watching people getting reunited after a long time, or a long distance. Have you ever watched those youtube videos where the military people that have been deployed surprise their loved ones? BAWLING! Those videos get me bawling! So, yeah. I’d love to surprise her someday on her birthday! That’s on my bucket list. Right next to spending Christmas with the fam, after so many years! I want to talk about REAL FLOWERS on cake for a sec here! 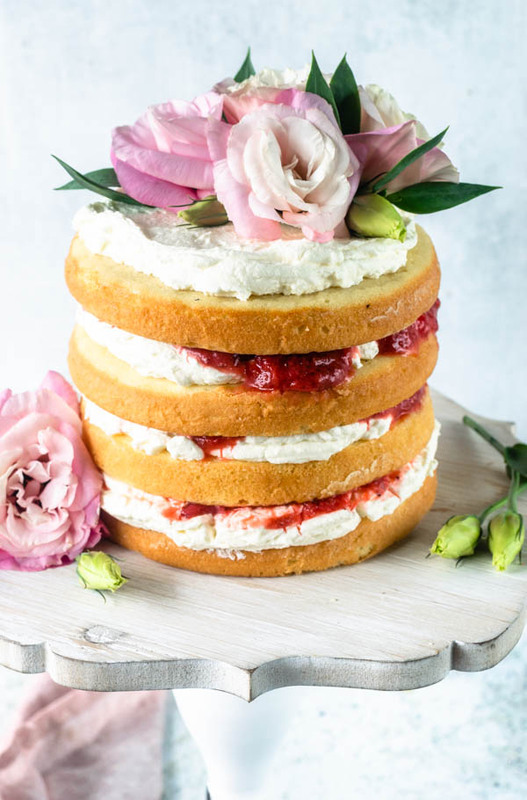 Make sure the flowers are suitable for putting on top of cakes. Ask your florist about it! They can’t have any pesticides, because well, it’s going on top of food! Make sure to gently wash and dry the flowers. 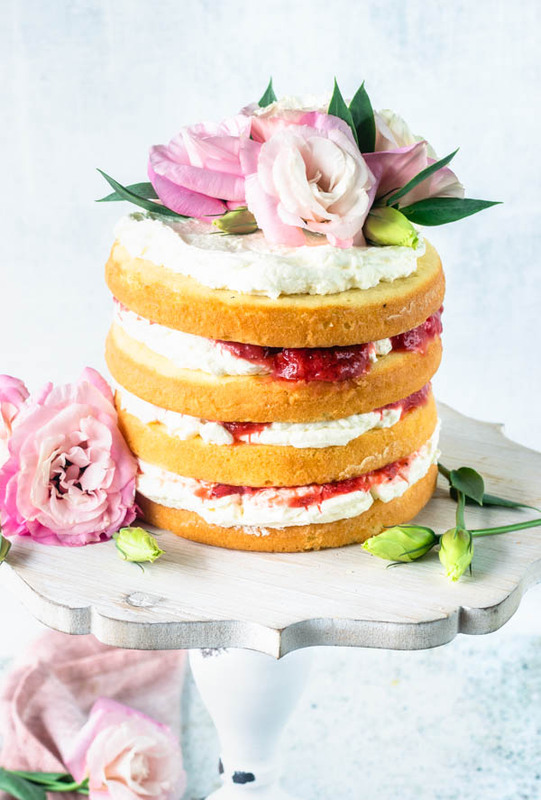 You can use a piece of parchment or wax paper to avoid the flowers from touching the cake, if you want to. I like to stick pieces of plastic straws inside the cake, this way I can insert the flower in the hole of the straw and it won’t be touching the cake or the filling inside. Leave the flowers in the water for as long as you can before placing them on the cake, so they won’t go wilted as fast. Some flowers will wilt faster than others. Roses usually keep pretty well for a few hours before starting to wilt. They will also keep well in the fridge! Those are my quick and humble tips for putting real flowers on top of cakes. Well thanks for reading about my sweet mama on today’s post! Hope you like my cake! 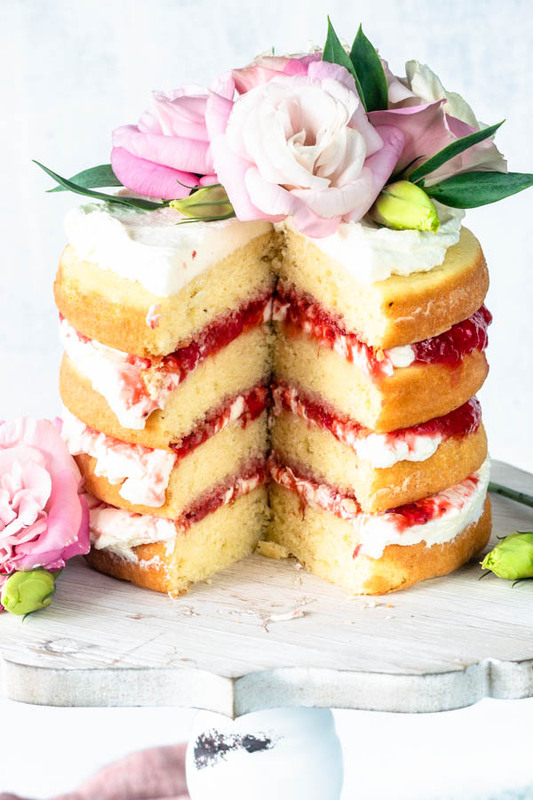 This cake has an Almond sponge, Strawberry Rhubarb jam in the filling, and Mascarpone Frosting. Delicious, summery, light! This cake is flawless! Mix all ingredients in a medium saucepan. Bring it to a boil over medium heat, keep stirring and let jam reduce. Cook for about 20 minutes, keeping an eye on it so it doesn’t stick to the bottom of the pan. If necessary, turn the heat down or add a tablespoon or so of water. Sift powdered sugar. Add half of the powdered sugar (1/4 cup) to the mascarpone cheese, in a small bowl. Add the other half to the heavy cream, in the bowl of a stand mixer. Whip cream, at high speed for 2-3 minutes, until stiff peaks form. While the cream whips, you can mix the mascarpone cheese and sugar with a spatula, until well incorporated. Add mascarpone cheese mixture to the whipped cream. Mix until incorporated. Make your sugar water hours before assembling, this way the syrup will be cold before pouring it on the cake. The syrup will make the cake moist and fluffy, and it will ensure that it stays that way for a few days! Don’t skip the syrup! To make the sugar water, simply bring sugar and water to a boil together, and let them cool before using. 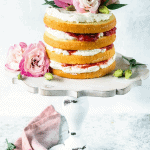 To assemble this naked cake, simply place the bottom layer on your cake plate. Brush sugar water on the top. Top with some Mascarpone Frosting. Put a few tablespoons of jam on top of frosting. Place the next cake layer on top. Repeat until the final top layer. Top with Mascarpone Frosting. I chose to decorate mine with flowers. You can pour some jam on top of the final Mascarpone Frosting, that will be pretty too! Cake will keep in the fridge for up to 4 days. What a beautiful cake! 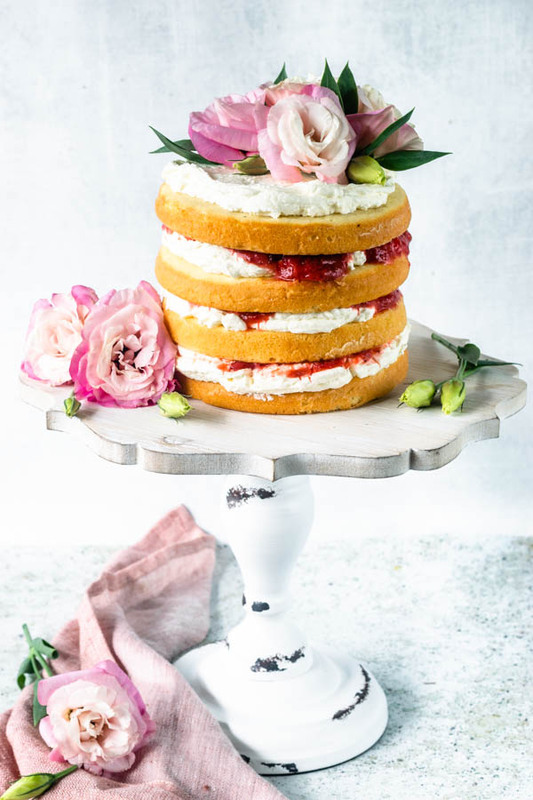 Love your tips on decorating with flowers and I love that strawberry rhubarb flavor combo! Strawberry Rhubarb never fails. Thanks! Holy cow! This cake is gorgeous and sounds amazing. I love the more naked look and the flowers – just beautiful! Aweee!!! Give her an extra tight hug!!!! those moments are the best!! Thank you, Sonal! This is the perfect cake for summer! So pretty! That cake is positively jaw-dropping. Today is my Mother’s Birthday — but I won’t see her until next week — I think this might be the cake we celebrate with. Gorgeous! Thank you, Lisa!! Happy birthday to your mom!! This cake sounds just absolutely incredible. I love almond and rhubarb, and I’ll bet its delicious together. I understand being away from family. My family is all in the same country, but we’re still spread out across it. I don’t seem them very often. This is just beautiful! The flowers really add a lot of beauty.